During the Civil War, the nation’s capital was ringed by a network of 68 forts and 93 gun batteries which were designed to protect it from Confederate attack from all sides.“Union troops were first stationed “in the vacant squares of the city, but as time went on, and the army continued to grow, they were pushed out into the suburbs, and on the adjoining heights,” noted Frederick W. Seward. “Many of these, under the direction of the engineers, soon became fortified camps and forts. In the course of a few months, every hill around Washington was crowned with an earthwork, and the city was ultimately surrounded by a cordon of fortifications, sixty miles in circumference.”1 Fort Stevens was located in Northwest Washington at the current intersection of Thirteenth Street and Quackenbos Streets. First called Fort Massachusetts, the redoubt was rechristened for General Isaac Stevens, who died in 1862 at the Battle of Chantilly. The President concluded to desert his tormentors today & travel around the defenses. [Quincy] Gillmore arrived & reported. Wright & staff also came in. At three o’clock P.M. the President came in bringing the news that the enemy’s advance was at Ft Stevens on the 7th Street road. He was in the Fort when it was first attacked, standing upon the parapet. A soldier roughly ordered him to get down or he would have his head knocked off. I can see a couple of columns of smoke just north of the White House. It is thought to be Silver Spring in flames — I was at Mr. Blair’s this evening: Fox says Gen. Wright tells him that Silver Spring is not burnt. The President is in very good feather this evening. He seems not in the least concerned about the safety of Washington. With him the only concern seems to be whether we can bag or destroy this force in our front. Part of Canby’s troops are here. The President seemed in a pleasant and confident humor today. The news from Sherman, if confirmed, is good — that the enemy intend to desert Atlanta. The President again made the tour of the fortifications; was again under fire at Ft Stevens; a man was shot at his side. The militia of the District are offering their services and the Department clerks are also enrolling themselves. In Judge Lewis’ office 87 men enlisted and organized themselves in 15 minutes. Last night the President’s guard of Bucktails was sent to the front. Went to the President’s at 12, being day of regular Cabinet-meeting. Messrs. Bates and Usher were there. The President was signing a batch of commissions. Fessenden is absent in New York. Blair informs me he has been early at the council chamber and the President told him no matters were to be brought forward. The condition of affairs connected with the Rebels on the outskirts was discussed. The President said he and Seward had visited several of the fortifications. I asked where the Rebels were in force. He said he did not know with certainty, but he thought the main body at Silver Spring. I expressed a doubt whether there was any large force at any one point, but that they were in squads of from 500 to perhaps 1500 scattered along from the Gunpowder to the falls of the Potomac, who kept up an alarm on the outer rim while the marauders were driving off horses and cattle. The President did not respond farther than to again remark he though there must be a pretty large force in the neighborhood of Silver Spring. I am sorry there should be so little accurate knowledge of the Rebels, sorry that at such a time there is not a full Cabinet, and especially sorry that the Secretary of War is not present. In the interviews which I have had with him, I can obtain no facts, no opinions. He seems dull and stupefied. Others tell me the same. It was said yesterday that the mansions of the Blairs were burned, but it is to-day contradicted. Rode out this P.M. to Fort Stevens. Went up to the summit of the road on the right of the fort. There were many collected. Looking out over the valley below, where the continual popping of the pickets was still going on, though less brisk than yesterday, I saw a line of our men lying close near the bottom of the valley. Senator [Benjamin Wade] came up beside me. Our views corresponded that the Rebels were few in front, and that our men greatly exceeded them in numbers. We went together into the fort, where we found the President, who was sitting in the shade, his back against the parapet towards the enemy. Generals Wright and McCook informed us they were about to open battery and shell the Rebel pickets, and after three discharges an assault was to be made by two regiments who were lying in wait in the valley. The firing from the battery was accurate. The shells that were sent into a fine mansion occupied by the Rebel sharpshooters soon set it on fire. As the firing from the fort ceased, our men ran to the charge and the Rebels fled. We could see them running across the fields, seeking the woods on the brow of the opposite hills. It was an interesting and exciting spectacle. But below we could see here and there some of our own men bearing away their wounded comrades. I should judge the distance to be something over three hundred yards. Occasionally a bullet from some long-range rifle passed above our heads. One man had been shot in the fort a few minutes before we entered. As we came out of the fort, four or five of the wounded men were carried by on stretchers. It was nearly dark as we left. Driving in, as was the case when driving out, we passed fields as well as roads full of soldiers, horses, teams, mules. Camp-fires lighted up the woods, which seemed to be more eagerly sought than the open fields. It was popularly believed in the North at that time that President Lincoln was greatly disturbed by the imminence of the danger of the capture of Washington; but I learned from his own lips that his chief anxiety was that the invading forces might not be permitted to get away. 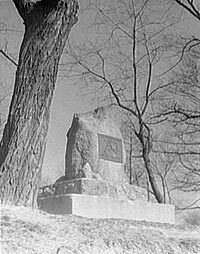 Speaking of their escape, afterward, he said that General Halleck’s manifest desire to avoid taking any responsibility without the immediate sanction of General Grant was the main reason why the rebels, having threatened Washington and sacked the peaceful farms and villages of Maryland, got off scatheless. Noah Brooks, Washington, D.C., in Lincoln’s Time, p. 22. Smith Stimmel, Personal Reminiscences of Abraham Lincoln, p. 56. John F. Marszalek, Commander of All Lincoln’s Armies: A Life of General Henry W. Halleck, p. 208. Noah Brooks, Mr. Lincoln’s Washington, p. 353-354 (July 12, 1864). Brooks, Mr. Lincoln’s Washington, p. 355 (July 12, 1864). Don E. Fehrenbacher and Virginia Fehrenbacher, editors, Recollected Words of Abraham Lincoln, p. 31. Michael Burlingame and John R. Turner Ettlinger, editors, Inside Lincoln’s White House: The Complete Civil War Diary of John Hay. Charles Bracelen Flood, 1864: Lincoln at the Gates of History, p. 196. John H. Cramer, Lincoln Under Enemy Fire, p. 27. Burlingame and Ettlinger, editors, Inside Lincoln’s White House: The Complete Civil War Diary of John Hay. Cramer, Lincoln Under Enemy Fire, pp. 43-43. Matthew Pinsker, Lincoln’s Sanctuary: Abraham Lincoln and the Soldier’s Home, p. 140. Marc Leepson’s Desperate Engagement, p. 200. Alexander Woolcott, “‘Get Down, You Fool!’” Atlantic Monthly, February 1838, pp. 170-173. Gideon Welles, Diary of Gideon Welles, Volume II, pp. 74-75. Silas Gamaliel Pratt, Lincoln in story, p. 173. Stimmell, Personal Reminiscences of Abraham Lincoln, pp. 64-65. Lucius E. Chittenden, Recollections of President Lincoln and His Administration, p. 423. Marc Leepson, Desperate Engagement, p. 181. Brooks, Washington in Lincoln’s Time, p. 177. John F. Marszalek, Commander of All Lincoln’s Armies: A Life of General Henry W. Halleck, pp. 209-210. Donald B. Cole and John J.McDonough, editors, Witness to the Young Republic: A Yankee’s Journal, 1828-1870, p. 453.